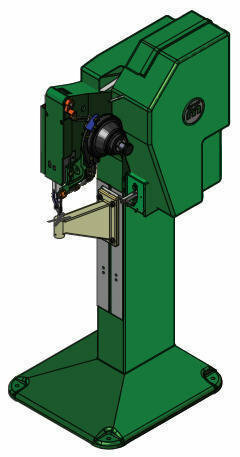 The Milford Model 410 is an electro-mechanical, flywheel driven, floor standing riveting machine; designed for operator loaded assembly applications. This single spindle riveter will automatically feed and set one semi-tubular rivet per cycle. Our standard unit comes equipped with a 120 volt motor, and controls for footswitch actuation. The cycle time of the riveter is under 1 second allowing for quick and efficient assembly operations. Able to form rivets up to 0.25" diameter, this model riveter is very useful and versatile. Typical applications where these units are used include HVAC assemblies, hinged assemblies, furniture components, appliance components, electrical devices, brake shoes, etc. Orbitform manufactures forming, fastening, joining, and assembly equipment for a wide range of industries and applications. We provide world-class prototype engineering services for assembly of parts and specialized forming and fastening. Orbitform's intelligent machines can monitor and control the manufacturing and assembly process. Baillie Sales & Engineering, Inc.
2763 S. Tree Gables Dr.